Apple just released the second beta of iOS 6.1.3 but how can you launch the second if you have not published the first beta version of the system? That's an explanation. After the appearance of continuous bugs in iOS 6.1, Apple was obliged to release updates to fix enforced. Because of this, the first beta of iOS 6.1.1 has had to be renamed to iOS 6.1.3. aware that we now have iOS 6.1.2 installed on our devices. The second beta of iOS 6.1.3 to Nadir continues to focus on improvements in the map application to Japan, in addition, this update fixes the bug that lets you skip the lock code. The big unknown remains the jailbreak untethered. We have published two iOS updates have not affected the Evasi0n exploit but will there be a third? iOS 6.1.3 seems to be little new firmware with external level but it seems that they will use to fix errors, security breaches and improve system stability. You do you think? Remember to download this beta of iOS officially 6.1.3 must be part of the Apple Developer Program. 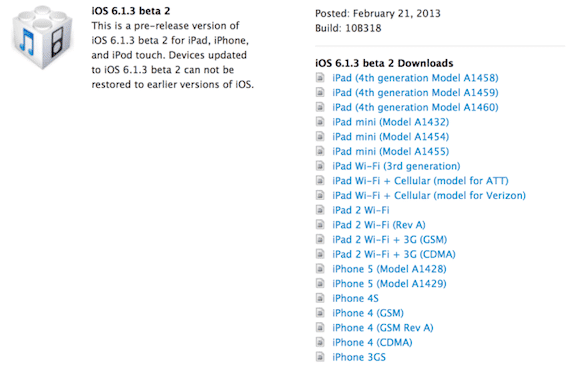 Article Apple launches second beta of iOS 6.1.3 was originally published in News iPhone .